The place was happening! Tables with each school’s detailed architectural model lined the hallways. Participants, teachers, mentors, parents, judges, and curious observers alike crowded around each station to catch a glimpse of the outstandingly creative projects. With the help of a teacher and – in most, though not all cases – an engineer mentor, teams were required to prepare a project plan; design a city using SimCityTM computer software; research and write solutions to an engineering problem; build a tabletop-scale model with recycled materials; and present their ideas before judges. The top six teams in the morning round of the competition competed again in the afternoon for first place in the regional finals. Special Awards were granted to other teams in a number of specific areas related to city planning and engineering. A volunteer from the APA PA Southeast Section (Karen Whitaker of Delaware County Planning Department) and Barry Seymour, Executive Director of DVRPC, were responsible for judging projects for two Special Awards: Planning Excellence and Regional Context. Parameters for the former included the accessibility of public space and mobility within city limits, while considerations for the latter focused on projects’ relationship with the world beyond city boundaries. All of the projects were unique and charming in their own right. A myriad of visions for our future cities, near and far, came to life through the children’s enthusiastic presentations. Independence Charter School’s (Philadelphia, PA) walkable, bikeable city with a dog park and beer garden was sensitive to contemporary planning and market trends. 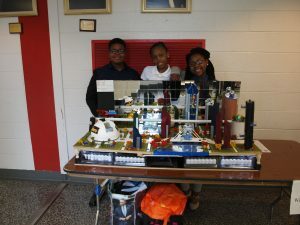 The students from Hedgepeth Williams Middle School (Trenton, NJ) modeled a future version of their hometown that emphasized environmental justice. Their project included a Steve Jobs Tech Institute, Obama Education Center, and AIDS research facility. Many of the projects incorporated hyperloop travel and renewable energies. Some focused on meeting the needs of a diverse population, while others touted a highly skilled workforce comprised of engineers and technology professionals. 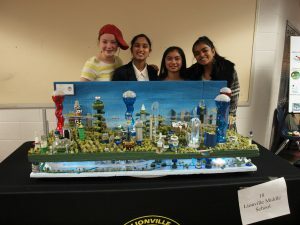 Lionville Middle School won first place and will go on to present at the National Competition in two weeks (February 18-21) in Washington, D.C. during National Engineers Week. As Frank Fox, President of Archbishop John Carroll, highlighted, “the Future Cities program encourages budding scientists, engineers, planners, and academics to reach beyond their limits in a collaborative team setting.” Creativity, ingenuity, excellence, and collaboration – that is the future we have to look forward to. For more information about the Philadelphia Future City Competition visit: http://www.futurecityphilly.org/.